Question on the polarity of the layers, what is that exactly? Yes, the conversion from PDF to Gerber was successful. Question on the polarity of the layers, what is that exactly? The polarity is the "composite level" value for any object on a certain layer. Gerber has a cool feature that lets you assign which objects can be filled as Dark (i.e. Paint) and which can be filled as Clear (i.e. scratch). Composite levels make it easy to define the fill rules for objects without the construction of complex polygons or geometries. 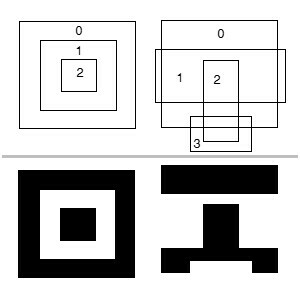 Essentially objects are drawn per layer in the order of their composite level, starting with 0 and increasing to a maximum composite level of 1000. All "even" (and zero) composite levels are filled dark (ie. Paint), while "odd" composite levels are drawn clear (ie. Scratch).